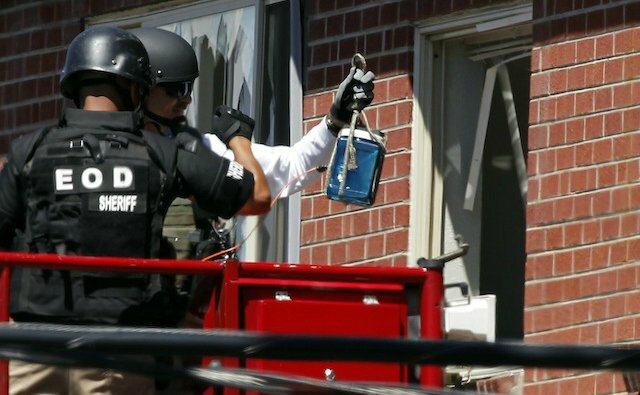 The apartment of James Holmes, the man suspected of killing 12 people at a Batman movie screening in the US state of Colorado, has now been cleared of explosives, police say. Robots were initially used at James Holmes’ home in Aurora, but agents still had to enter without setting off any remaining devices. Police said the suspect had acted with “calculation and deliberation”, taking ammunition deliveries for months. The Arapahoe county coroner has now released the names of the dead. Michael Dobersen said all the victims’ deaths were related to gunshot wounds. In addition to those killed, 58 people were also hurt in the attack at a Century 16 cinema in Aurora, a suburb of Denver. A man in a gas mask and body armor threw tear gas canisters at a midnight screening, then fired on the crowd in the cinema. James Holmes, 24, was arrested outside the cinema, police said. President Barack Obama is to visit Aurora on Sunday to honor the victims, the White House said. He will visit bereaved families and meet local officials. FBI agents and police discovered the home was booby-trapped when they used a camera at the end of a 12-foot pole to look inside. Early on Sunday the bomb squad staged a small controlled explosion in the building and officers disarmed trip-wires and an incendiary device. The first trip wire was strung across the doorway of the flat, and inside were reported to be jars filled with accelerants, chemicals that would explode when mixed together and more than 30 improvised grenades. Dan Oates said: “This apartment was designed to kill whoever entered it,” adding that would most probably have been a police officer. “If you think we are angry, we sure as hell are angry about what has happened to our city, to the wonderful people who live here and what he threatened to do to one of our police officers,” he said. Residents were evacuated from the building and four other premises nearby. Hundreds of mourners joined a vigil near the cinema in Aurora on Friday night, leaving candles and flowers outside. James Holmes was said to be armed with a rifle, a shotgun and two pistols when he launched his assault on the midnight screening of the new Batman movie The Dark Knight Rises. He also bought 6,000 rounds of ammunition over the internet, Dan Oates said. The police chief said that all weapons and ammunition were purchased legally within the past few months, and that the suspect had received a high volume of packages to his home and work place. Among the dead listed by the coroner were a six-year-old girl whose mother was injured and two US servicemen. The University of Colorado Hospital said it was still treating five patients in critical condition. The Medical Center of Aurora said four of its patients remained in intensive care. Authorities have established no terrorism link, nor any motive, and James Holmes had no criminal record other than a speeding fine. Arapahoe County Sheriff Grayson Robinson told Reuters news agency that James Holmes was being held in solitary confinement for his own protection. “We typically do this in high-profile cases. It has nothing to do with any specific threat,” he said. James Holmes will appear at Arapahoe County District Court, in nearby Centennial, Colorado, on Monday at 09:30 local time.